Japan is an archipelago made up of 6,852 islands — albeit several that are just 3,000 feet in circumference. Even so, it has an astonishing 18,486 miles of coastline, putting it at the top of the list of shoreline-rich countries. (Only Canada, Greenland, Russia, Indonesia, and the Philippines have more, and of those, the first three have frigid waters.) That means that Japan is awash in wonderful beaches. It also has its very own, unique beach culture. On your next trip to Japan, make sure to include some beach time. First, know your beach rules. Japan has a long history as a sovereign nation, with a love of martial arts and precise rules for almost every activity. Swimming and beachgoing are no exceptions. There are 18 martial arts in Japan, and swimming is one of them. There is even a Japanese Swimming Federation that works to preserve the art of “traditional combat swimming” and also holds competitions for people of all ages. As part of this tradition, famous martial artists have been known to train in flash floods to heighten their awareness of swimming. Try wielding a stick or a gun or wearing samurai armor in water, and you’ll begin to understand some of the history of swimming in this island nation. 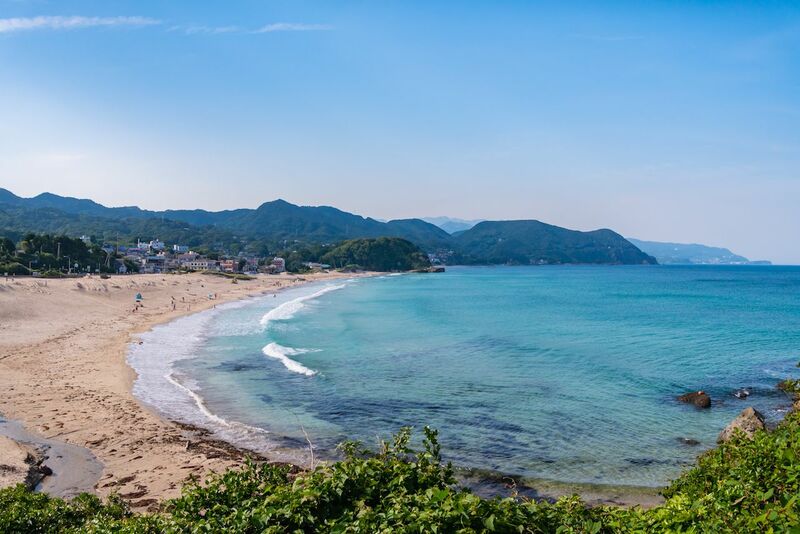 As for rules, you should know that there is an official opening of beach season called umibaraki, or sea-opening, before which swimming is not allowed! This happens at different times on different beaches. Organizers make sure to clean up the beach and put out nets to keep bathers safe from marine life before the umibaraki ceremony. Japan’s public cleanliness policy also means you’re unlikely to find any trash receptacles, so pack out what you pack in when visiting beaches. In addition, because of the history of the yakuza, or gangsters, who are practically the only members of Japanese society with tattoos, you would need to cover any tattoos before going to a public swimming area. However, there are handy sites, like this one in English, telling you where you can go if you have tattoos. On a happier note, unlike many Western countries, Japan does not have open container laws — so you’re welcome to imbibe alcoholic drinks while at the beach. Some of the fun traditions at Japanese beaches include sukiwari, which is kind of like Marco Polo with a watermelon and a stick. One person is blindfolded, given a long wooden stick called a boken, and spun around, after which he’s supposed to whack open the melon on a tarp on the beach — all while observers attempt to mislead him. Eventually, after someone is successful, everyone shares in the sticky feast. While you may have to look for signage alerting you to dangers like jellyfish, you can also look for beach houses where they may rent out bathing suits, boogie boards, and body boards; serve food and alcohol; and offer locker rooms. And unlike the US, where fireworks happen just once a year, in Japan, fireworks displays are the symbol of summer. Ask around about local hanabi events. Because of the length and varied ecosystems of Japan, its beaches can range from volcanic sand to pebbles to white sand, so you can take your pick. Although it was in Okinawa where occupying American soldiers first introduced the Japanese to the sport of surfing, it’s the town of Ichinomiya that will host the very first Olympic surfing competition in 2020 at Tsurigasaki Beach. Ichinomiya is located on the Boso Peninsula, just across Tokyo Bay from the national capital. To watch pros and locals, find the torii gate along the beach on the southern end of Road 30, but do not attempt to surf here; unspoken rules are the most important in Japan. Luckily for visitors, Ichinomiya — which has been growing since the 1980s, filling with those who want to surf year round — will only become more tourist-friendly. While most small towns in Japan are emptying of young people, Ichinomiya is experiencing a revitalization, with new surf shops, restaurants, and homes, as well as 600,000 visitors a year. “The California of Japan” is the nickname for the Shonan region of Kanagawa, centered on Enoshima (Eno Island) southwest of Tokyo. It’s been a swimming resort since California was settled by European Americans, and in a country obsessed with hard work and sacrifice, it has a bit of a hedonistic air about it. That’s because once upon a time only the elite could or would afford to spend time laying around on beaches. For surfing, hit Kugenuma Beach, near Kugenuma Kaigan station. 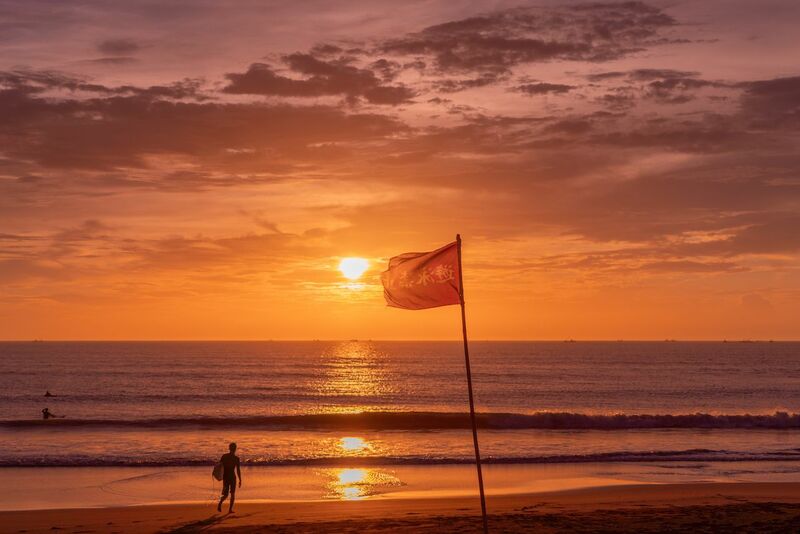 Lifeguards are on duty during July and August. Beach volleyball courts are free to use, and hot water showers, foot washes, lockers, umbrellas, beach toys, and lounge chairs are available to rent everywhere. 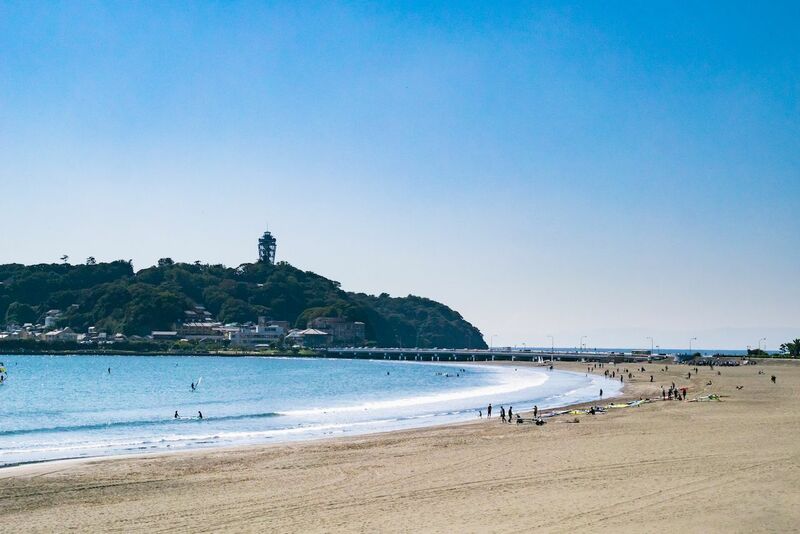 For swimming, hit a couple of the Enoshima beaches, which are also patrolled by lifeguards and lined with beach huts. After that, check out Chigogafuchi, a marine plateau with an elevated walkway from which you can see Mount Fuji — hopefully at sunset. The nearby Enoshima Iwaya Caves, created by coastal erosion, have been worshipped for centuries. They are rumored to have been visited by Kobo-Daishi, who founded Shingon Buddhism, and Minamoto no Yoritomo, founder of the Kamakura Shogunate. You can borrow candles to check out the statues and exhibits inside. At Tannowa Tokimeki in Sennan in Osaka Prefecture, you can see Japan’s only permanent beach volleyball stadium, Shiosai Beach Volleyball. The best beaches are Pichipichi and Tokimeki, both in Satoumi Park, where the region’s midsummer Osaka Marine Festival is held. 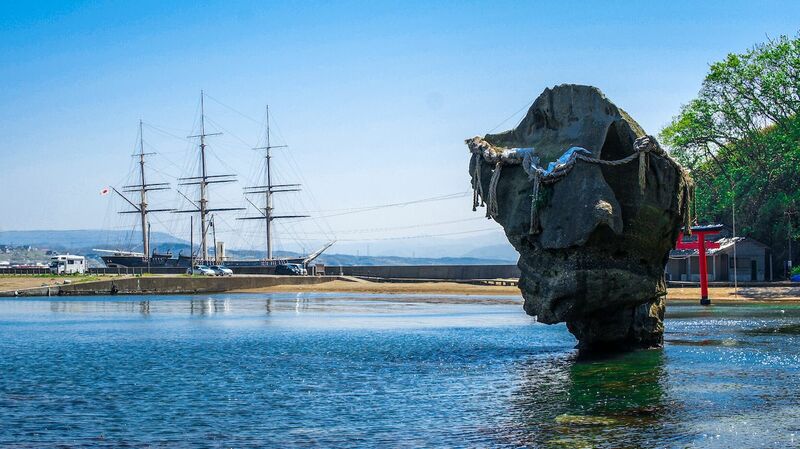 Little kids will enjoy the Iruka (Dolphin) Park, with its octopus slide and Tarzan rope swing. On Tannowa Beach, you can dig for clams to your heart’s content. 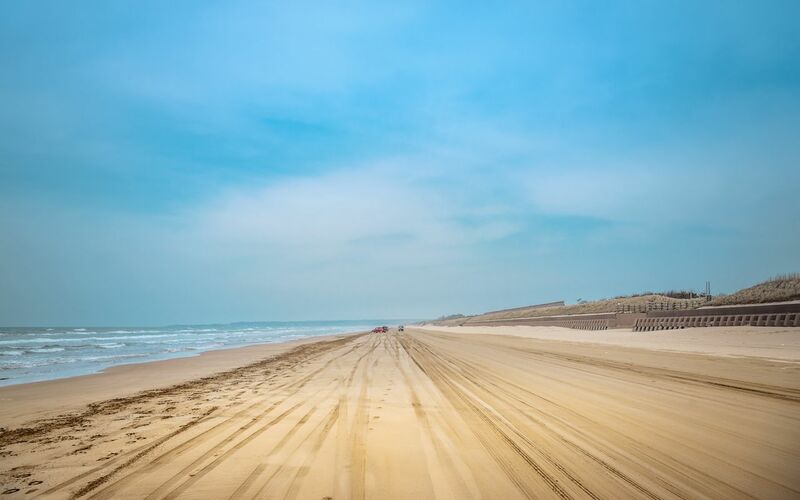 We don’t normally think of cars and beaches together, but auto (and bicycle) enthusiasts can visit Chirihama Nagisa Driveway on the Noto Peninsula in Ishikawa Prefecture and drive along the five-mile stretch of hard sand beach between mid-March and late November. Stop for photo ops, seashell gathering, or a meal. A tasty repast might include grilled clams and the local delicacy, grilled turban snails (sasae no tsuboyaki) washed down with sake and beer. Among the fascinating environmental and manmade features nearby are rock formations, a sea salt operation, and rice terraces. Shirahama in Shimoda on the Izu Peninsula is one of Japan’s famous white sand beaches, just a 10-minutes bus ride from Izukyu Shimoda Station. Because it’s the only place in the world where, according to UNESCO, “two active volcanic arcs collide” with a unique “continuous volcanic geological history,” the entire Izu Peninsula has been designated as a UNESCO Global Geopark. Beyond the beaches, you’ll find evidence of Japan’s opening to the West — after General Perry insisted on it — with gunboats in Shimoda. There is also great hiking. Try the Jogasaki Coast, which features the Kadowaki Lighthouse, a suspension bridge, the Flower Park Museum, and Renchokuji, a temple. The area also has hot springs. If you want to combine ocean viewing with hot springs, book a room at the ryokan Bousui in Shizuoka, built in 1958, which boasts open-air public baths right on the coast. For those who want to experience more of the ocean than just the beach, Jodogahama Beach is a little more than five hours from Tokyo, including two-and-a-half hours on the bullet train. It’s in Iwate Prefecture on the northern end of the main island of Honshu. 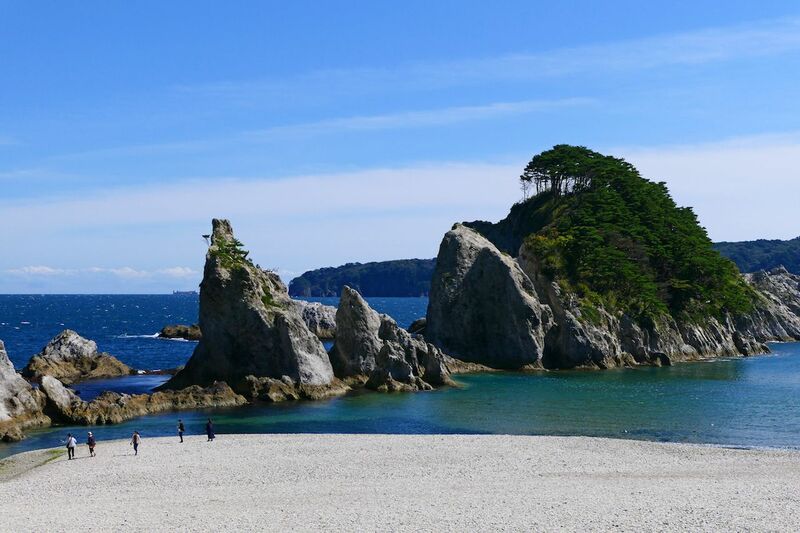 Called one of Japan’s best 100 beaches, it is situated on a clear, sheltered inlet. In 2011, the tsunami destroyed some facilities, but all have been rebuilt. You’ll find a visitor center, walking trails from there to the beach, and several options for boat cruises. Among the cruising options is the Blue Cave Cruise, which departs from Marine House and takes you to Aonodokutsu, a cave filled with cobalt blue water and accessible only by sea. 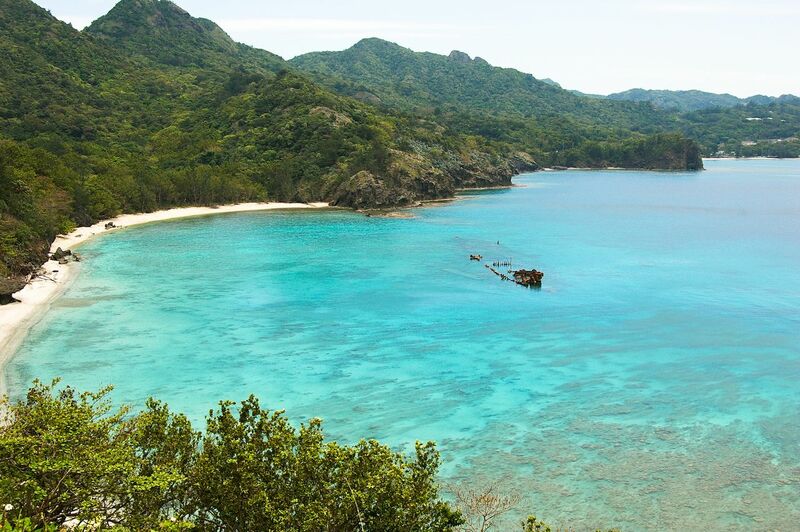 Far, far from Tokyo (620 miles, to be exact) are the Ogasawara Islands, which you will reach via a 25.5-hour ferry ride. It will be completely worth it. As in Okinawa, the swimming season here lasts from June to October. At a comfortable 77°F, Chichijima, the largest inhabited island of the group, will beckon you to its white sand beaches and clear blue water. It’s a snorkeling, sunbathing, and swimming paradise. Kominato Beach and Kopepe Beach are near the Kominato Kaigan bus stop, and the latter features underwater markers pointing out coral species unique to these islands. Local delicacies include sea turtle sashimi and shimazushi, which means island sushi, as well as nigiri sushi made of marinated sawara, or Spanish mackerel, which is served with karashi mustard rather than wasabi. Kamome Island in Hokkaido is at about the same latitude as Toronto, so you might not think of it as a beachy place. But this piece of land, which is actually a peninsula connected to the mainland by a 1,600-foot sandbank, is both a natural breakwater for the port of Esashi and a superb place for swimming, camping, and fishing in the summer. Just 660 feet wide and 0.62 miles long, with 1.6 miles of coastline, it’s a darling site for a cozy day of outdoor activities — and a history lesson. The sacred Heishi rock, which rises like a bulb out of the sea, is festooned with the Shinto symbol of nature’s awesomeness: a shimenawa, or straw rope with paper streamers interwoven. According to legend, at some point in the distant past, the herring, for which the island is still known today, disappeared from the sea. A fortune-teller threw a bottle of magical liquid — some say water, some say sake — into the sea and the herring returned. The bottle itself turned into the Heishi rock, which represents the god of the Sea of Japan. During the Edo period, it was worshiped as Bentenjima (Benten Island), after the Hindu goddess of water and fishermen, Saraswati. During the first weekend of July, strapping young men are blessed at the local shrine and, dressed only in fundoshi (a strip of cloth wrapped around them like a pair of trunks), swim out to the rock carrying a new, 1,000-pound replacement shimenawa. The two-day festival includes a rowing competition, a parade of people wearing traditional costumes, taiko drumming, and a karaoke contest. 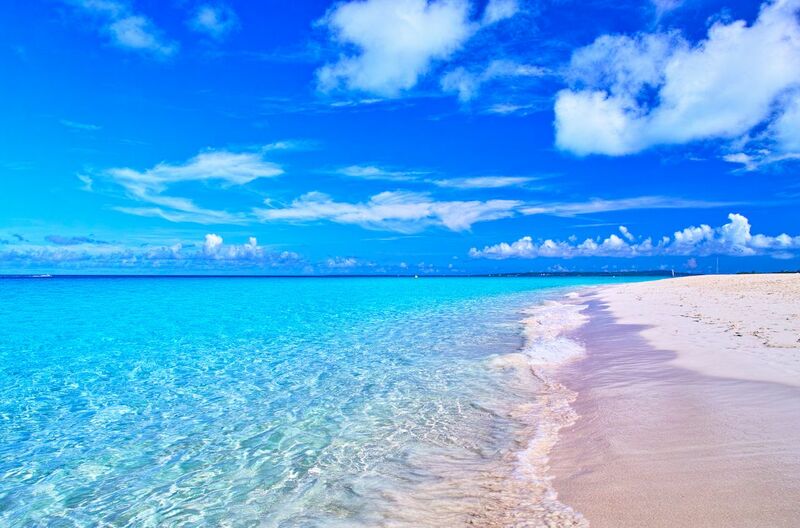 At the other end of Japan are the 21 glorious tropical islands of Okinawa. Miyako Island, situated on the same latitude as Miami, Florida, is known as the best diving spot in Japan and hosts divers year round. Scuba instruction to earn NAUI certification over three days costs just ¥55,000 (about $500). Diving tours by Miyakojima Diving Aquatic Adventures take divers to three islands to see manta rays, tropical fish, sharks, underwater caves, shipwrecks, sea turtles, and coral. Of Miyako’s beaches, Yonaha Maehama may be the best beach in East Asia, but it’s rivaled by Nishihama, on Hateruma Island, the southernmost inhabited island in Okinawa. 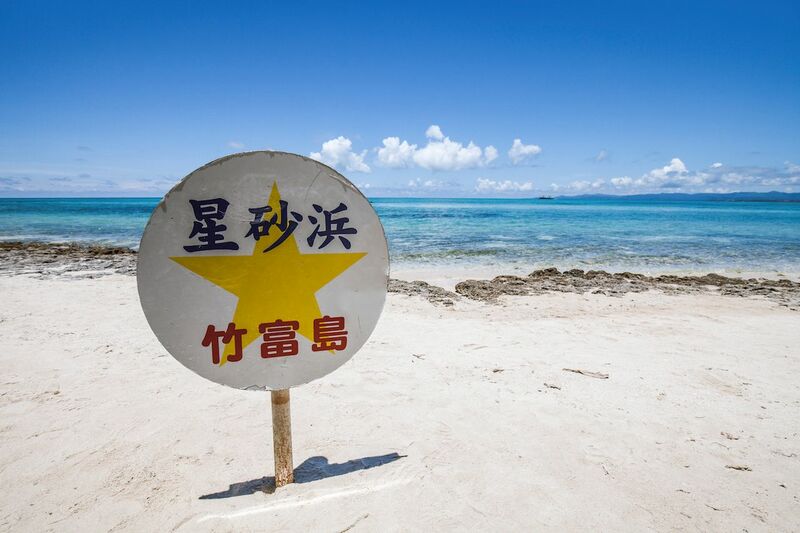 Turquoise water plus silky sand equals the best vacation ever, and it’s just two and a half hours by bus and ferry from the New Ishigaki Airport.